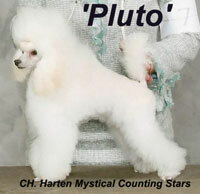 We have sweet, loving Toy and Tiny Toy puppies that have been home raised with lots of love and attention. Health is first and foremost; therefore all parents are genetically tested prior to breeding. 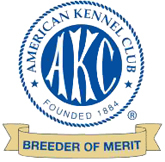 These tiny pups are Champion sired, AKC registered, vet checked, up to date on shots, micro-chipped and have a one-year written genetic health guarantee. 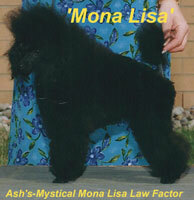 ASH'S MYSTICAL Toy Poodle puppies are occasionally available in white, cream, black, blue, silver, silver beige and brown. Sorry, we do not have parti colors. 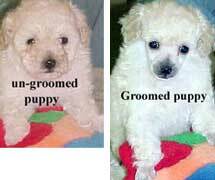 Small size makes these puppies quite fragile, and therefore they are not recommended as a pet for families with toddlers or very young children. 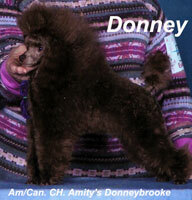 The AKC registers all POODLES 10 inches at the shoulder, or less, as a Toy Poodle. In the market place, you will find that full-sized Toys normally weigh 7 to 10 pounds and Tiny Toys weigh 4 to 6 pounds. True Teacups are 4 pounds and under, but have many health issues, including a shorter life span. 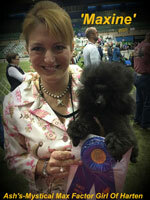 Note: There is no such thing as an AKC registered Teacup or Pocket Poodle; they are all registered as Toys. 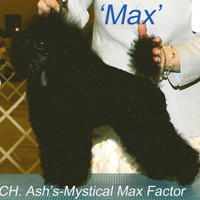 'Maxine' ... Ash's-Mystical Max Factor Girl Of Harten.